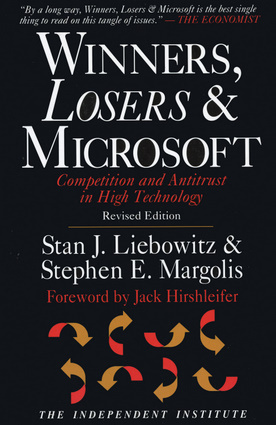 Stan J. Liebowitz is a professor of managerial economics and the academic associate dean in the school of management at the University of Texas at Dallas. He has written on the topics of copyright and technology, broadcasting regulation, pricing practices, and mortgage discrimination. Stephen E. Margolis is a professor of economics and the head of the economics department in the college of management at North Carolina State University. His research includes work on housing markets, pricing of medical services, monopolistic competition, and economic efficiency in the law. They have jointly written numerous scholarly articles on the subjects of network effects and lock-in that have appeared in the Journal of Law, Economics and Organization; Harvard Journal of Law and Technology; and the Journal of Law and Economics. Their more popular articles have been published in the Christian Science Monitor, Investor’s Business Daily, and the Wall Street Journal.